Black and white is Christmas too. My husband Rod is allergic to fir trees. Since we found this out, we've not had a live Christmas tree. Just as well there's no tree this year as the kittens would make short work of it! 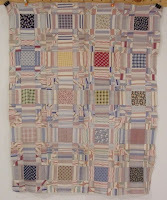 But last winter I got out an old wool quilt project and finished it. It was fun couching shiny black rat tail cord over the piece sketchbook-style following a chalked 'doodle tree' outline. This year Doodle Tree is our Christmas tree and that's fine. I think black and white with warm red is a wonderful holiday color scheme. The black, white and gray wools were all old suiting samples. I remember the guy at the custom tailor shop in Lansing, Michigan had bagged up his older samples and was slinging them, bag upon bag, into the dumpster. One of the bags burst open and I saw the wools and asked, "Are all those bags wool samples?" He replied, "Yes-my Mom used to make quilts but she passed away and now nobody wants them." Tell me, how could I not take the stuff home? He filled the back of my Toyota pick-up with the bags and they moved with me to North Carolina. Aside from the red wool borders and rat tail cord, all the elements of Doodle Tree are from those wool samples. I love quilting on wool. You can use bigger stitches (I quilted with black carpet thread) since the stitches tend to sink into the material if they're too small. The Doddle Tree quilt was finished with black binding and I hung it on the wall this year. 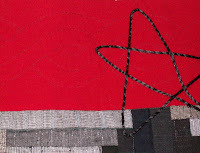 If you click the star detail you can see the black quilting stitches close up. Merry Christmas and happy quilting to you all. I'll never in my lifetime get to see everything in New York City that I want to and now must add another item to the list. Textile merchant extraordinaire Mary Koval has just opened a store selling her beautiful old quilts and textiles in the city! It's called Green Planet New York Ltd and is at 520 5th Avenue. Mary and her husband Joe are always in attendance at the Houston International Quilt Festival, plus they exhibit and sell overseas (Tokyo, Paris etc). 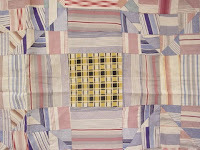 Their wares span centuries: toiles and palampores from the 1700s right up to mid-century (1950) folk art quilts. Mary also designs fabric lines for Blank Quilting. But if you're a quilter you can't go to the city without visiting The City Quilter! http://www.cityquilter.com They're at 133 West 25th Street, between 6th (also called Avenue of the Americas) and 7th Avenues. And you can bring home a lovely fabric souvenir since City Quilter prints NYC-theme fabrics. Take a look at their Subway Map against black--wouldn't an old fashioned Log Cabin design done in this smart stuff be a great modern take? But how can you do NYC without a visit to the best deli ever? I'm referring to Katz's of course. http://www.katzdeli.com/presentation.html You remember: it's where Meg Ryan (Sally) has her favorite melt-down in "Harry Met Sally" and an onlooking woman says, after Meg stops groaning and writhing, "I'll have what she's having..." This is also the deli where a huge sign in the window says: Send a Salami to Your Boy in the Army. The slogan got international recognition when Jerry Lewis in his first flick "At War With the Army" (1950) sang the beans song http://www.youtube.com/watch?v=eWhhoySpevw and this was forever embedded in our brains-- "The navy gets the gravy but the army gets the beans, beans, beans, beans..." Love it. So go have fun in New York--see some great antique quilts, buy some fabric, and pig out on pastrami at Katz's. Some time ago my friend Alex Dupre made a wonderful crazy quilt block and sent it to me as a gift. The fabrics are mainly raw silk and metallics and the piece has both our names on it. Alex was a Tennessee girl who had ended up in New York City. We met and instantly hit it off. Crazy quilts aren't usually my cup of tea but this one's a personal favorite. Alex is gone now and this little baby is a tangible reminder of a sweet and funny soul. The wool quilt is a French piece and wonderfully over-the-top with folky embroidery. I mean, if you're gonna be crazy, why not go all the way? It tries to start out with squares in the middle but then devolves to its true crazy nutzo nature at the sides. Details. I could spend years looking at the details in old quilts. 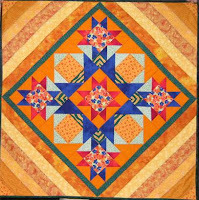 Like the way the colors in this Sunburst block in an old Mississippi quilt are stronger in some areas than others. I wonder why she chose a stripe for the center circle? And another stripe for the sashing around the block too. Look how the heavy fan-pattern quilting runs right over the whole thing. Interesting eccentric details. Years ago while researching quilting patterns (the stitched designs) I was lucky enough to be working in the David Pottinger collection of Amish quilts. Dave had a beautiful pole barn-type building with built-in shelving for his quilts. The shelves could then be covered by roll-down "blinds" of heavy blue denim to protect the quilts from dust and light. On the second day, Dave came into the building and watched me work as I transferred designs from an old quilt to sheets of flexible Mylar. He watched as the black marker traced onto the Mylar the hidden designs. He was amazed. "Those designs are on my quilts?" he asked in astonishment. 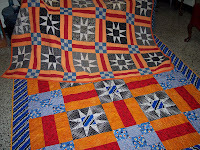 Then I knew that he had collected those wonderful quilts exclusively for their colors and graphic effect. 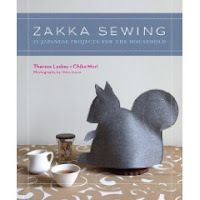 He hadn't seen or understood the function or the subtle beauty of the stitches. His own comprehension aside, Dave Pottinger did a great job of recording and collecting Amish quilts from a particular area in Indiana. 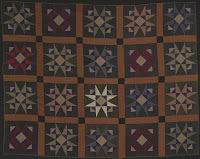 If you'd like to see the Pottinger quilt collection online, much of his collection is viewable here http://museumcollections.in.gov/info.php?page=0&v=1&s=amish+quilt&type=all&t=objects&f=&d= at the Indiana State Museum. Lots of folks are like Dave Pottinger and it's especially true in our favorite craft. Unless you understand how a quilt is constructed, you can miss the details. And I love the details. Here are a few favorite photos of quilt details. 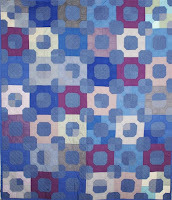 I don't always have an overall shot of the quilt but then again, I don't need the entire image to appreciate the work. Kind of like eating just the cherries off a sundae. Why do you suppose this 1940s quilt from Quebec has gaps in its borders? For the pillows perhaps? And isn't this a nutso block? 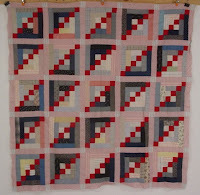 'Busy' is too pedestrian a term to describe the frantic movement of the blocks vs. the pieced sashing. This quiltmaker obviously thought white strips between blocks was boring so decided to jazz the quilt up with rick-rack sashing. Don't you wish you could go back and ask these folks questions? As soon as women became literate, they started putting words into their quilts. 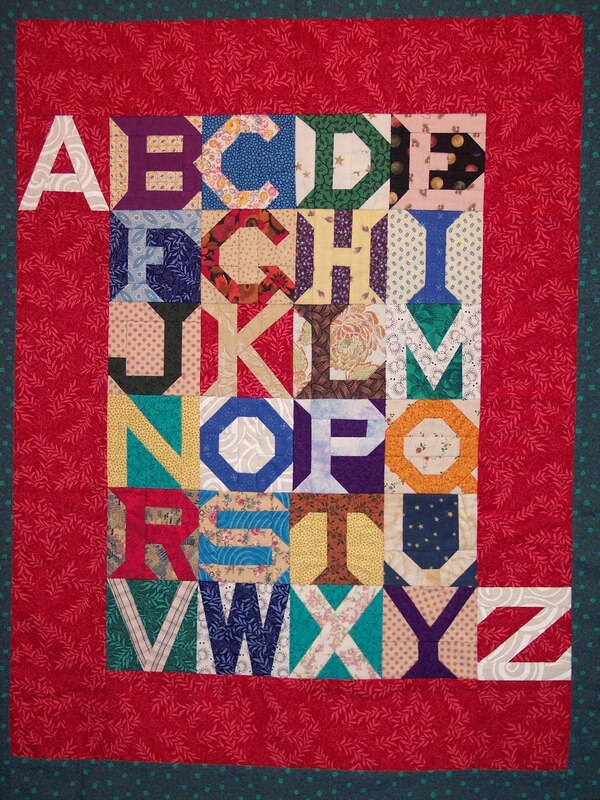 Whether an inked signature block given to a friend or an alphabet quilt designed to subtly educate a child, words and quilts go together. 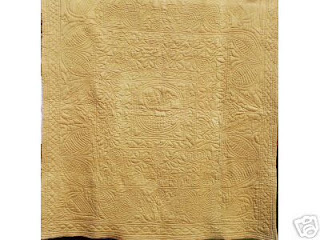 Sometimes it's not even a word but an image, such as this hand print in an antique Rob Peter to Pay Paul quilt in my collection. Clues like this make me want to know more---Who was she? From where? And why did she sign her quilt with her hand outline? It's possible that the quiltmaker did not know how to write but this didn't deter her from wanting to claim her work. In the United States, the literacy of women in the 19th century tended to lag about 25% behind men's literacy until the Civil War in the 1860s. Women who formerly had been only semi-literate learned to read because newspapers printed accounts of the war and lists of those killed in battle. And women passed on their literacy when they applied their skills to their quilts. 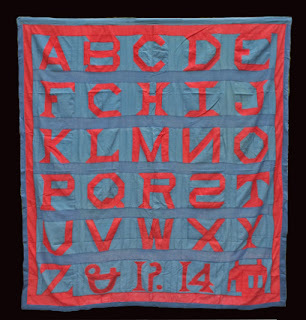 This early 20th century quilt top (an ebay picture) solves the problem of extra space quite well with a lazy ampersand, the date (1914), and a schoolhouse. 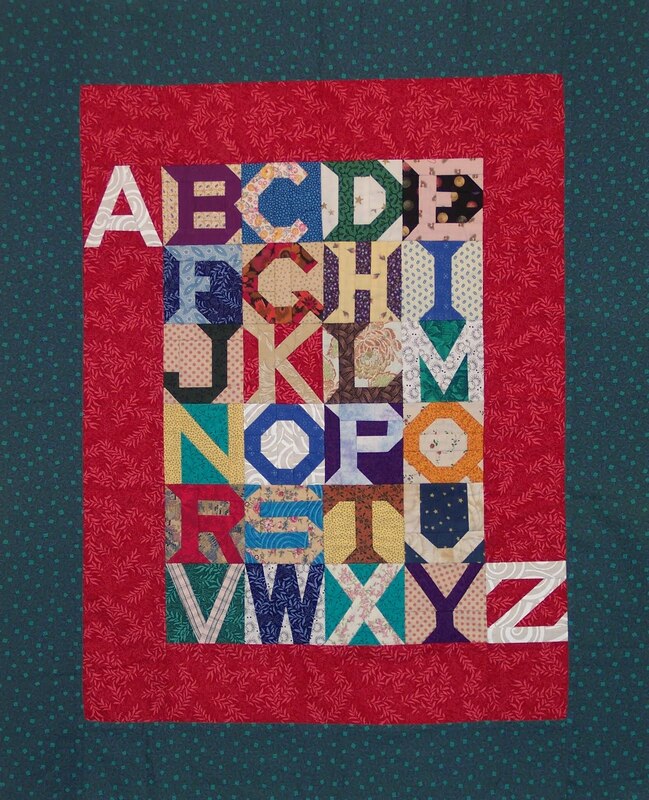 In the early 20th century a mail order quilt pattern company included these letters in their offerings and just the catalog itself must have inspired folks to try an alphabet quilt. That's what happened to me. 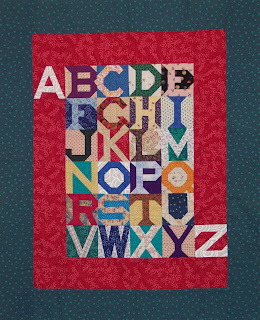 I re-drew the c.1920 letters in small size (3" square) and relied on paper piecing to get nice straight lines. I solved the odd number of letters problem by breaking out of the border top and bottom. Women have always known how to talk and when they learn to read and write, you can't shut them up--not even on their quilts. Antique Quilt Appraisals this Saturday! Our own version of the Road Show! 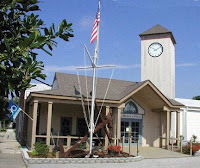 This Saturday November 7 is the Carteret County Historical Society's 'Antique-A-Thon' and it's happening at The History Place, our county museum, on the corner of Arendell and 12th Street in downtown Morehead City, North Carolina from 9:00 a.m. - 3:30 p.m. The public is invited to bring in family items for antique experts to evaluate. A $5 donation item is required for every two items. All sorts of expert appraisers will be there. Bring decoys, furniture, paintings, textiles (that's me! ), books, guns, clocks, silver, stamps, coins etc. Go root around in your attic and china closet and come on down! Who knows--maybe you'll find you possess something incredibly rare and valuable. Of course, the reverse can be true too. That ancient 'Ming' vase may have made yesterday in Hong Kong. But that's the fun of this event--bring your heirloom, tell the story, learn its value and history. Very cool. Note: because the Veterans Day parade is also that day, I'd come early, get appraisals done, go outside for the parade at 11, and then stay for lunch at the Tea Clipper restaurant right in the same building. The Clipper's quiche is great and they make dainty tea-size sandwiches and salads. My favorite tea is their Lady Earl Grey, with cream and sugar-no lemon. This week is jam-packed and frankly I have no original thoughts for this blog post. 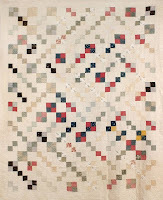 But then again, pictures of antique quilts are what you're reading this for, right? When I'm on the road teaching and lecturing, the question is always asked (sometimes in an acerbic tone) : "Do you bring real quilts or are we going to see yet another slide show?" Audiences want to see quilts 'in the cloth.' I understand. Presenting a slide show, particularly at an evening meeting of the local quilt guild, is like a great big invitation to a siesta. Here in the South especially, quilters sated on sweet tea and desserts will nod off as soon as the lights go down. Maybe I should do a "mime lecture." That's where I won't say anything but just hold up quilts and let the audience admire them. 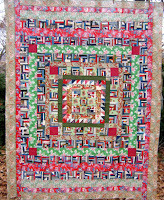 That said, I have oodles of pictures of quilts on my computer and it's time to put them to work. The pictures here are of wool quilts. Not as popular today as cotton but formerly, when you needed a warm quilt, wool was the fabric of choice. The Solomon's Puzzle quilt is from my own collection and was in Happy Trails, the book I wrote on the Drunkard's Path pattern. This thing is heavy as a dead mule. It's all wool, heavily machine-quilted, and that brown is an old Army blanket. I saw this wonderful quilt while in Spokane, Washington at the North-West Museum. The blocks are a variation on the Fifty-four Forty or Fight pattern-makes you want to work in solid colors when you see a piece like this! 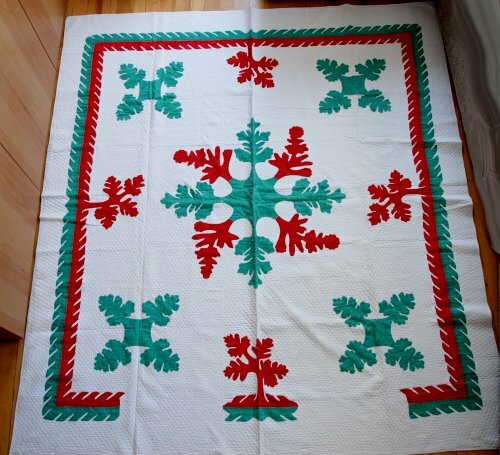 And I missed this incredible Welsh wholecloth quilt on ebay. It has a dragon quilted in it! And a harp! And I should have cashed in my IRA and gone for it. Feast your eyes. Don't get me wrong--I love color. But a quilt made in a subtle palette can be so refreshing. Particular color groupings are getting type-cast. For instance, orange/pink/turquoise/lime green and brown are THE Retro palette primaries. Color combinations that formerly would have been considered jarring are commonplace. What's going on? My own musing: perhaps our on-line viewing of fabrics and quilts plus how a photographed quilt comes across in a magazine has deeply influenced how we choose colors for our quilts. Brighter seems better. Perhaps it's just natural orneriness or a lifelong tendency to swim upstream but I seem to be entering a different phase of quilting. I'm starting to work with colors that five years ago I couldn't have touched. In particular I'm looking at greys, taupes and browns, and blues and appreciating these quiet colors more. 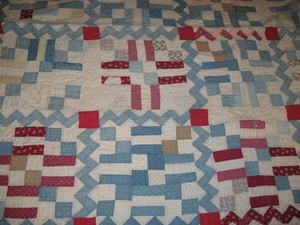 To the right is an antique quilt top that I found pictured on an online auction...I was too late! Hints when working with subtle colors: choose a graphic pattern-don't settle for any old patchwork block. Make sure you understand what's dark, medium, and light. 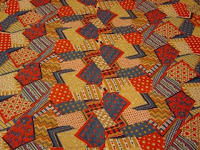 And finally, don't be afraid to combine groups of patterns to achieve an overall effect. Here are a few other beauties that get me doodling and pulling fabrics. Interesting how pale pink lattice strips calm down the bright red used in this Log Cabin variation. 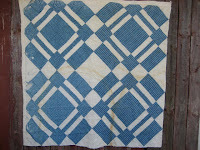 And then this 1950s Rising Sun quilt in blues and browns. The occasional yellow sun rays are lovely sparkles but the whole composition would be quite different if all the blocks sported yellow spikes. That one bright turquoise block, second from the left last row, is just a great accent here. I apologize for not noting where I got this indigo image. It's not a quilt...it's an inspiration for a quilt. Hmmmm. I wonder what's going on? Am I becoming more contemplative? Is it simply a stage I'm going through? Is it, god forbid, because my hair's turning gray? Can't be! I think I'll blame the shift on other influences. The phrase "true blue" is ancient and stems from the famous colorfast blue cloth woven and dyed in medieval Coventry, England. In the 1600's patches of blue fabric were worn as a sign of being 'true blue' by the Covenanters, a group of Scottish Presbyterians sworn to uphold the National Covenant that opposed the rule of James I of Scotland. This verse was written by Samuel Butler: "For his Religion it was Fit, To match his learning and wit; 'Twas Presbyterian true blue." Blue came to be associated with the conservative party in Britain and today we still see vestiges of Coventry blue in the political maps of blue (Republican) and red (Democratic) states. 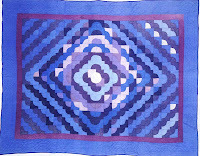 Regardless of your politics, blue is found in many quilts and here are a few favorites. Many of these images are Amish quilts. A few were snatched from internet auction sites. They're posted here just for enjoyment. 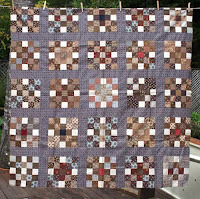 A simple design with four large blocks makes a whole quilt. 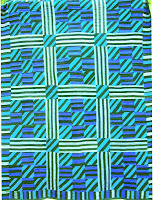 A strippy Nine Patch quilt from Holmes County, Ohio finds its best friends are green and lavender. Inspiration is all around us, as this blue scene, photographed from the second floor great room at the Quilters Beach Party, shows. You haven't heard of the Quilters Beach Party?! Go to this link: http://www.albfabrics.com/quilter_beach_party.html . 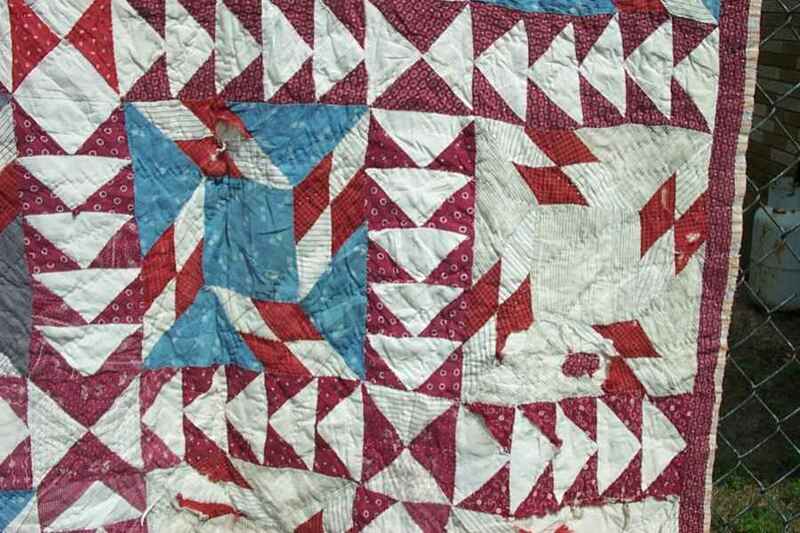 If you love seeing the stitches in old quilts, no doubt you admire Amish quilts. 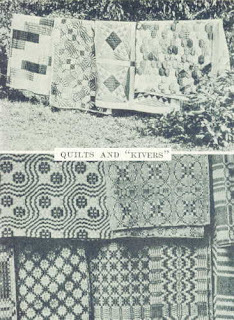 But did you know that Welsh quiltmakers have been making quilts in their own style for perhaps even longer than the Amish? 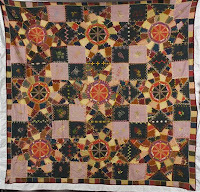 And on the dramatic dark color wools and flannels, the hand quilting stitches show beautifully. Good news: Jen Jones, an American who lives in Britain, has opened her excellent collection of Welsh quilts to public view at a new museum. Please click on this link to see the video clip from BBC. http://news.bbc.co.uk/2/hi/uk_news/wales/8179225.stm. Ms. Jones also has a beautiful website and sells a book about Welsh quilts http://www.jen-jones.com/ definitely a 'must see' if you're going to England. 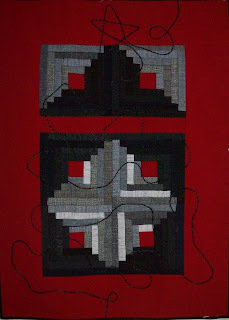 The image at the head of this blog post is a close-up from a Welsh wool wholecloth quilt that I own. Bought on ebay, I was surprised when it arrived and discovered that the backing was a damask linen tablecloth dyed bright red! My apologies for the crummy quality of the overall picture but you can still discern the interesting designs. Warning: if in England and you see a quilt that looks like a traditional Amish Center Diamond, do not comment as I did-you might get in trouble! 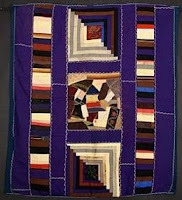 Me at the Malvern quilt show years ago: "What an unusual Amish Center Diamond quilt! Grey, red, black, and forest green..." A dark-haired woman rounded on me immediately:" I'll have you know that's a Welsh Center Diamond and the Amish got the design from us!" Oops. If you're throwing dice (playing craps) and you toss a 2,3, or 12, that's a losing throw and you 'crap out.' But in the dictionary of American slang, 'crapped out' also means to abandon something because you're tired of it. When I comes across really complex or nutzo old quilt tops, I wonder if the maker "scrapped out." Perhaps constructing the top tired them out and they never got around to quilting the thing. 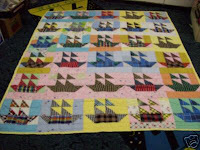 Or they gave it to someone who was supposed to finish the quilt top but who never learned to sew. I'm thinking this might be the case here. My apologies-I can't remember where I got this picture--I'd filed it under 'inspirations' but hadn't noted the source. If it's yours-email me for credit. When someone had access to lots of the same sort of scrap fabric, interesting compositions happened. Like this quilt top likely made from 'cut-aways' from a shirt factory. The close-up picture shows how involved the maker got when dealing with these subtle stripes. Not to everyone's taste but I think an altogether engaging piece. This quilt top below going great guns and then...the quiltmaker put it away and forgot about it? Or her fiance was lost at sea and she hadn't the heart to finish? Who knows! 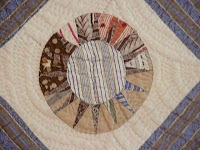 We could write volumes of fiction about the "what if" of our UFO's -unfinished objects to the non-quilters. 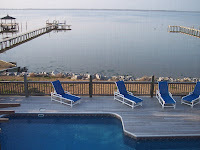 Plus, it's too hot to quilt right now here at the North Carolina coast. 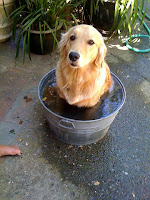 This is what I'd do if I could find a bucket to fit me!